Ahki-ekwanīsit nintanihšināpēwinihkās. Namē nīn nintōtēm. Nintanihšināpēhkwē. Asātiwi-sīpīnk nintōncipā mīnawā Pasqua First Nation. [Aki-egwaniizid nindanishinaabewinikaaz. Name niin nindoodem. Nindanishinaabekwe. Azaadiwi-ziibiing nindoonjibaa miinawaa Pasqua First Nation]. This means: "Earth Blanket is my traditional name. Sturgeon is my clan. I am an Anishinaabe woman, I come from the Poplar River (a Nakawē Anishinaabe First Nation in Mantoba) and also from Pasqua First Nation (a Nakawē Anishinaabe First Nation in Saskatchewan)." Who and what am I? First and foremost, I am a First Nations woman, mother, and grandmother and an artist. Our pain as a Aboriginal People keeps my heart wrapped in tears. It provides inspiration to my fingertips that search this realm for lost hope. 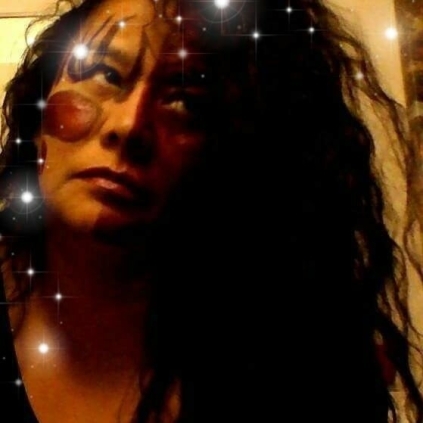 I am a First Nations woman, mother, and grandmother and an artist, can you feel my love reaching out through my work? What does it mean for me to paint? I do not need to promote my work vehemently or explain it in great detail in order to "sell" myself. I don't cut corners to make simple paintings in an effort to be called an "artist." Each painting is given just the time that it asks for. When I sit in front of a blank canvas it's like generations of ancestors are drawn to the need in my heart as I put all my heart breaks, hopes, desires, and love for humanity into a single piece. 98% of the time I touch the canvas and as I close my eyes I see the piece already. Each painting is a prayer from deep inside me and the beauty of its birth brings tears to my eyes. Painting for me was so private in the beginning that no one ever met the artist. For years people assumed I was a man. I dabbled ever since my mother taught me but never considered myself an artist. That first painting when I reached deep inside myself in an effort to express the history of pain many children endure, I became an artist healing through my work. I had no idea that so many other people would find that healing as they look at the beauty of my dreams as I strive to see in humanity what I put on canvas. Simone McLeod, born in Winnipeg, Manitoba in 1962, belongs to the Name doodem (Sturgeon clan) of the ᓇᐦᑲᐌ (Nakawē-Ojibwe Anishinaabeg). She is a member of Pasqua First Nation in Saskatchewan. Simone, who feels a strong spiritual kinship with her mother's people, the Azaadiwi ziibi Nitam, or Poplar River First Nation of Manitoba, is a versatile artist: not only does she paint, she is also a talented poet, writer, and photographer. Simone McLeod descends from a long line of Ojibwe Midewiwin healers on both parental sides. Her traditional Anishinaabe name is Aki-egwaniizid, or Ahki-ekwanîsit, which means Earth Blanket, or All That Covers the Earth. 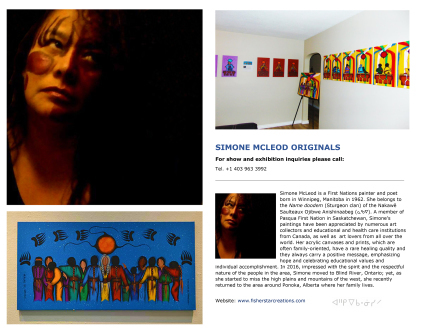 Although she is considered a Medicine Painter working in the traditon of the Canadian Native School of Woodland Art, Simone definitely holds a unique place in the art heritage of her People. As she works in the tradition of the Aboriginal Medicine painters of her People, Simone McLeod humbly considers herself a healing artist. Not only do her works of art testify of the hardships of her personal journey through life and the beauty and the pain of her People; her paintings and prints represent the rainbow of all people on this planet. Her canvases often depict people in situations that she longed for as a child. She finds solace in painting children interacting with adults, parents, grandparents, and members of whole communities healing together. While this has been the main focus of Simone's work, one of the features that clearly distinguish her work from that of other Woodland artists, is that the human beings in her paintings never have faces. Simone never paints faces because she feels it important to reach children. She wants the children to feel happy, loved, and part of the community, and feel like things will be great in the future, when they stand in front of a painting. Simone wants the children who see her paintings to daydream, and to tell the artist stories about what they see - instead of the other way around. Put faces on a painting and the children can no longer relate to the piece; it then loses that special connection shared by both adults and children who enjoy Simone's work. As a painter and a poet, Simone is dedicated to making visible the beauty and the pain of her People. With courage, honesty, and humor Simone McLeod fought her way out of a background of abuse and neglect to find the upright path of her ancestors. Her work deals with several various, yet interrelated themes, the underlying leitmotiv being child abuse and domestic violence within First Nations communities. Each and every of her artworks is dedicated to the cause of those countless women, men, and children who suffered the same fate as she did. Her canvases and limited edition prints, brought together under the trade name Simone McLeod Fisher Star Creations, have a rare healing quality and they always carry a positive message, emphasizing hope and celebrating educational values and individual accomplishment. Simone takes pride in creating in her paintings and sketchings and poems a peaceful world in which she and the women and children of her People could live happily. She focuses on humans and animals representing doodem (clan) symbols and describes her sketchings, paintings, and poems as prayers of hope for all. Simone's paintings have a spiritual content that is reminiscent of the spirit powers of the midewayaanag (medicine bundles) that her ancestors carried - which were living objects, or manidoog in themselves. Made of animal skin, these bags were usually filled with spirit guardians and sacrificial and healing items, including small pouches of dried herbs and roots whose spiritual and protective properties aided in the curing of ailments. Like the midewayaan, Simone's paintings carry and represent the beliefs and identity of her ancestors, their long migration history, their strength and resilience and healing as a People, as well as their innate kindness, generosity, and faith in a better future. I have several of your art work dating from 95-98. I believe my uncle would have bought them from you. They are not framed. There are 5 large ones and two smaller ones. My uncle passed away in 06. He lived in Prince Albert,and was know for buying native art. Some of his pieces are from artist that were just getting started. Osiyo!!! Give thANKHS and appreciation for your work from which many blessings and inspirations emanate. Continued success. I am going to do the research again on you and I would love it if you could answer me back. I love your art and how you work and I think it would be a really great learning opportunity for me. i am doing a reasearch project on you for my RTI class and i would love it if you could answer me. Your work inspires us. We purchased "Praying for Tomorrow"
at the WahSah gallery in Winnipeg today. If you please Ms., what does this piece mean to you?